a little over a year ago, my other half took me to a cooking class at whole foods for a birthday present. it was, truly, one of my favorite gifts he has ever given me. we went together, after leaving the girls at home with my parents, and cooked an incredible menu with about 5 other couples. we laughed, ate well, drank good wine, and met new people while learning a few new things in the kitchen. for real, it was one of my favorite nights ever. the menu included a wonderfully hearty beef stew with wild rice, a rustic berry tart, buttery biscuits, and this lovely salad. the whole technique with the goat cheese really intrigued me, as i had never seen it done before but thought was crazy brilliant. at our station we had a little bit of the goat cheese leftover after wrapping the rest in the basil leaves.. you can bet i ate that straight out of the bowl. and the dijon vinaigrette has become a staple in my house, one of my favorite basic vinaigrettes that can go on pretty much any salad. 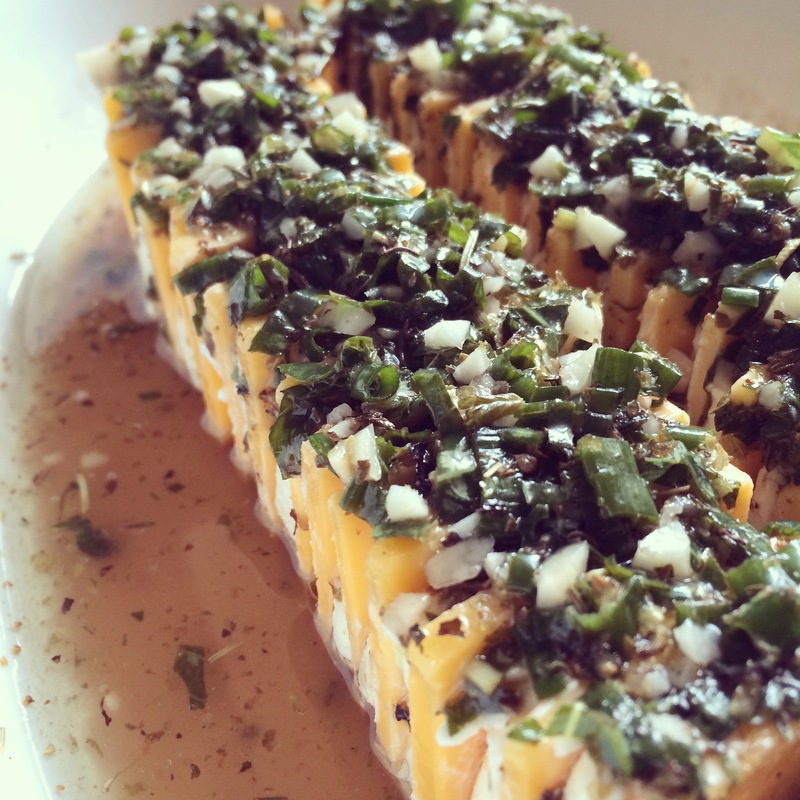 1. in a small bowl, stir together the goat cheese, lemon juice, and a drizzle of olive oil. (if your goat cheese is harder, add a little more olive oil to soften.) add a small pinch of salt and freshly ground pepper – a couple twists of the grinder. mix well, cover with saran wrap, and place in fridge to chill. 2. preheat oven to 350. spread out walnuts on a dry cookie sheet. roast in the preheated oven for 5-7 minutes. place on drying rack to fully cool. 3. in a mason jar, mix 3/4 cup olive oil, vinegar, dijon, agave/honey, and another small pinch of salt and freshly ground pepper. shake vigorously until well incorporated. 4. after the goat cheese mixture has had at least 15-20 minutes to chill, remove from fridge. on a clean surface or cutting board, remove stems from basil leaves and roll each leaf out flat. place a bit of goat cheese mixture onto the base of each leaf, and then roll the leaf up, wrapping the goat cheese mixture completely with the leaf. once rolled, using a serrated or very sharp small knife, carefully (saw the knife gently back + forth as to not break the leaf) slice the rolled leaf into small sections (you should get about 3-4 slices per leaf.) continue until all basil leaves have been used and sliced. 5. in six or so salad bowls, begin to assemble the salads. 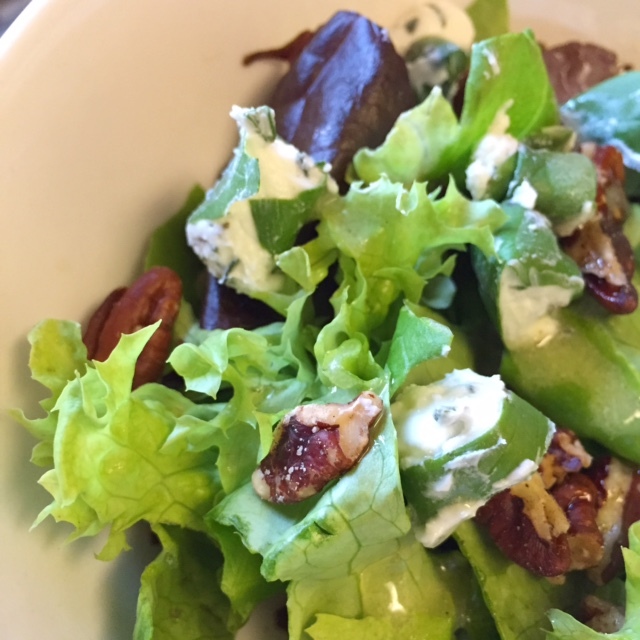 first the greens, then the basil leaf/goat cheese slices, sprinkle with toasted walnuts, and drizzle generously with vinaigrette. *i stress using fresh herbs here, if possible. while home in austin for the christmas holiday, my mom and i went grocery shopping at central market (if you’re not familiar, it’s like the best grocery store ever – similar to whole foods). it was a gorgeous afternoon and we sat outside as we ate lunch before hitting the aisles. yes outside. in late december. just one of the 5,834,395 reasons i love texas. we had grabbed a few of their prepared snacks for lunch, some sushi and this amazing couscous salad. we both would have licked the plastic container if there weren’t so many people there. i knew as soon as i got home, i would have to give it a go, and try to make it myself. and obviously, since i am posting the recipe, i am super happy with the results. 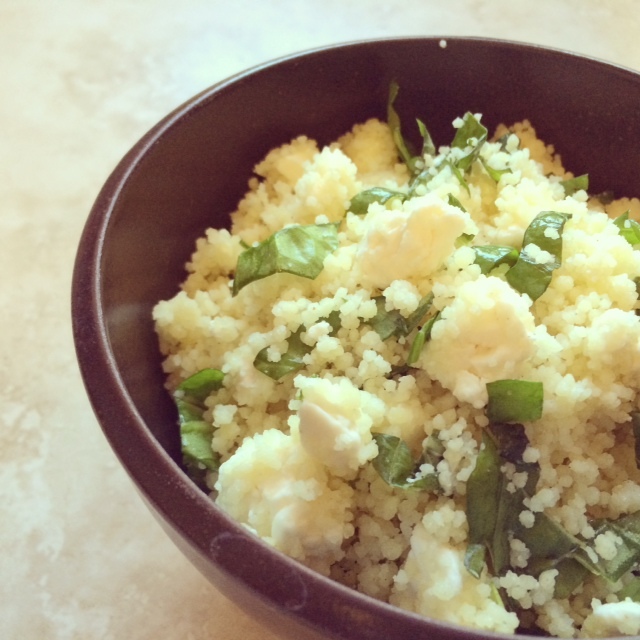 (this is just my interpretation of the couscous – i didn’t get this recipe straight from CM.) a huge bonus: this recipe takes about 10 minutes to make. it is light and bright, with fresh basil and tangy lemon juice. the spinach adds interest and great nutrition + vitamins. and the feta.. oh the feta. i could put feta on almost anything. 1. bring 1 cup water and 1/4 tsp sea salt to a boil in a small saucepan. once boiling, add 1 cup couscous and stir well. cover and remove from heat. let sit for 5 minutes. 2. once couscous is done, add olive oil, fluff with a fork or spatula and transfer into a bowl. add feta, chopped spinach, basil, and white pepper. squeeze the juice from 1/2 a lemon over top and mix well. serve chilled or at room temperature. after stuffing my face with this, i am convinced it is THE best way to eat spaghetti. at least it’s become my personal favorite way. it’s got a wonderful combination of tartness – from the lemon – and flavorful warmth – from the sautéed garlic and bright basil. the parmesan cheese rounds it all out with rich nutty and butter flavors. light & fresh mixed with a hint of comfort food. 1. in a dry skillet over medium high heat, toss the pine nuts, to brown. watch carefully and don’t burn them, just brown them a bit. pour them into a separate bowl and set aside. 2. in the same skillet over medium high heat, add the olive oil. add the garlic and saute about 2 minutes; being careful not to burn. once it’s just beginning to brown on the edges, remove from heat and set aside. 3. cook pasta according to package directions, drain and place in serving bowl. drizzle pasta with a bit of olive oil to moisten and stir. 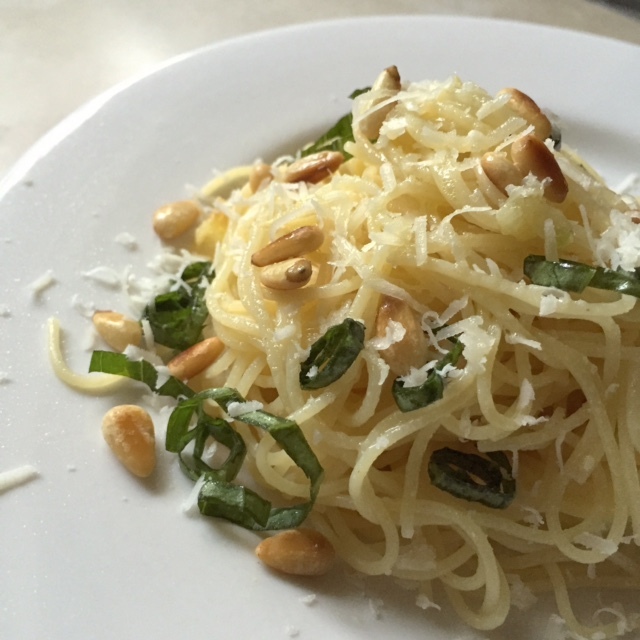 add lemon juice, sautéed garlic, pine nuts, basil, and parmesan cheese. toss well.